We are days away from the second round of the French presidential elections between a banker candidate, Emmanuel Macron, who wants to rule France like a start-up company, and the president of the Front National (FN), Marine Le Pen. She has temporarily stepped down from this position for this second round but will, without doubt, resume her role as soon as the election is over. Le Pen wants to significantly and systematically consolidate France’s white supremacy and nationalism, even though a lot of noise is produced around the question of voting for or against the latter. Some of those who refuse to serve as the eternal bulwarks against the FN are activists who, because of their race, religion, sexuality or immigration status, would likely become the first targets of a Le Pen presidency. It is not possible to judge them for their position, which says a lot about the degree of their resignation. However, other advocates of the non-vote on Sunday are people who do not risk much from a Le Pen administration. One could even say that they might indirectly benefit from it, and it is those who seem to have forgotten what the FN stands for. Founded in 1972 by Jean-Marie Le Pen (the father of Marine), this political party has been at the forefront of nationalist programs and ideology in Europe for more than four decades. I am writing this text exactly twenty-two years after the murder of Brahim Bouarram, a young Moroccan drowned by a group of FN sympathizers in the Seine river in Paris. This reminds us also of the massacre of October 17, 1961, when a few hundred Algerian men were thrown into the river by French police under the orders of the infamous Paris Prefect, Maurice Papon (more on this historical episode soon on The Funambulist blog). In 2002, a few years later, J.M. Le Pen won the second largest number of votes in the presidential election and a large part of the French population took to the streets to demonstrate fierce opposition to the values propagated by the FN. As a result, the opposing candidate, standing president Jacques Chirac, was reelected with 82 percent of the votes. Since 2011, when JM. Le Pen’s daughter, Marine Le Pen, was elected new president of the party, JM. Le Pen has remained the FN's President of Honor. The FN undertook a “de-evilization” process that has much more to do with the way it markets itself than how its actual political programs have (or have not) evolved. Such a marketing strategy seems to have paid off if one considers that Marine Le Pen has a real shot in Sunday’s election. Many analyses can be written about the nationalist and racist ideology developed by J.M. Le Pen (in its most explicit forms) and Marine Le Pen (in only slightly more disguised forms), but as we saw all too well with the election of the current President of the United States, the visceral sometimes has to take over the intellectual presentation of arguments. This is, therefore, the story of an object - an object that has a lot to say about France’s last century of history, as well as the current moment France is experiencing before the second round of the country’s Presidential Election. It is an object that links three eras of structural racism in France. The first one is the military occupation of the country by the German army between 1940 and 1944. The second comprises the murderous violence deployed by the French state against decolonization movements in Indochina, West Africa, the Maghreb (Algeria in particular), as well as on its own soil. The third can be found in the last twenty years of French politics, during which the father-and-daughter’s Front National became an unavoidable actor in a representative democracy in decay. This object is a knife. 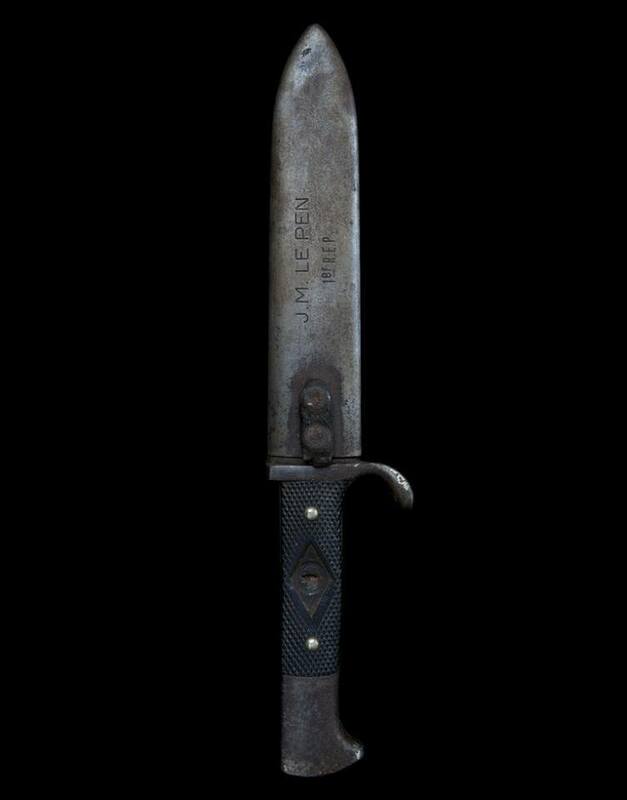 As we learn from reading a 2012 article written by journalist Florence Beaugé, it is a knife found by twelve-year-old Mohamed Cherif Moulay on March 3, 1957, in a dark corner of his house in Algiers’ Casbah. The night before, a group of French paratroopers had entered his family house and tortured his 42-year-old dad, Ahmed Moulay, in front of his wife and his six children, with water, electricity and at least one knife, before killing him. The knife was forgotten by one of the soldiers and later found and hidden by Mohamed Moulay, then 12 years old. It is only in 2003 that the knife left the Moulays’ house, when the Algiers correspondent of the French newspaper Le Monde brought it back to France to be used as an evidence in the trial for defamation that Jean-Marie Le Pen attempted against Le Monde. Five centimeters long and 2.5 centimeters wide, it is the same kind of knife that was used by the Hitler Youth. It was fabricated by German knife makers in the Ruhr, according to an investigation made by journalist Sorj Chalandon. The blade bears the name of J.A. Henckels, manufacturer in Solinger. On the sheath, one can read J.M. Le Pen, 1er REP. This article is published simultaneously with The Funambulist blog. Léopold Lambert is editor-in-chief of The Funambulist magazine.